Cancer is a term used for a large group of diseases that can happen almost anywhere in the human body. Cancer starts because of abnormal cell growth without stopping. They may spread into surrounding tissues and other organs. In 2012, new cancer cases and cancer deaths increased to 14.1 and 8.2 million, respectively. It is expected that in 2020, 20 million new cancer cases will be diagnosed and 12 million cancer-related deaths occur. It is shown that plants have been used for the treatment of cancer since a long time ago. Since the cytotoxic effects of plant compounds, such as biflavonoids, bicoumarins, and biquinones, have been proven, the plants have been considered as an acceptable source for the preparation of drugs., In recent years, cytotoxic drugs prepared from Catharanthus roseus, Podophyllum peltatum, and Taxus brevifolia are used in the cancer treatment regimens., For this reason, scientists have a special interest in medicinal plants for the discovery of new anticancer drugs. This study was aimed to evaluate the cytotoxic effect of S. rosmarinus against HeLa and HePG2 cell lines. Compounds used were methanol, n-butanol, chloroform, n-hexane, 3-(4,5-dimethylthiazol-2-yl)-2, 5-diphenyltetrazolium bromide (MTT), NaCl, KCl, NaOH, HCl, H2SO4, NaHCO3, Na2HPO4 (Merck, Germany), penicillin/streptomycin (Sigma, USA), RPMI-1640, fetal calf serum (FCS), sodium pyruvate, trypsin, L-glutamine (Gibco, Scotland), dimethyl sulfoxide (DMSO) (Fluka, Italy), and doxorubicin (Farmitalia, Italy). Aerial parts of S. rosmarinus were collected from Aghda desert near Yazd, one of the central provinces of Iran, on November 2011. They were identified by Mahboobeh Khatam Saaz as S. rosmarinus. A voucher specimen (No. 3532) was deposited at the Department of Pharmacognosy, School of Pharmacy and Pharmaceutical Sciences, Isfahan University of Medical Sciences. 100 g of aerial parts of S. rosmarinus was finely powdered, and extraction was done by a four-step method. Extraction was started with nonpolar solvent and went forward to completely polar solvent. Extracts were prepared by maceration method using n-hexane, chloroform, chloroform/methanol (9:1), and methanol solvents. Each step lasted 1 day while stirring. To prepare butanol extract, methanol was removed from the filtered methanol extract by evaporating under reduced pressure in a rotoevaporator until two-thirds of the initial volume was removed. Using a separatory funnel, the remaining aqueous extract was partitioned with n-butanol, 1:1 (v: v) overnight at room temperature. The n-butanol extract was collected. After filtration, the resulting extracts were freeze-dried. Then, they were stored at 4°C until use. HeLa and HepG2 Cell lines were purchased from Pasture Institute, Tehran, Iran. RPMI-1640 medium (supplied with 10% FCS) as used for cell maintenance. The assay was performed based on erythrocyte lysis in 96-well microtiter plates (Nunc, Wiesbaden, Germany). 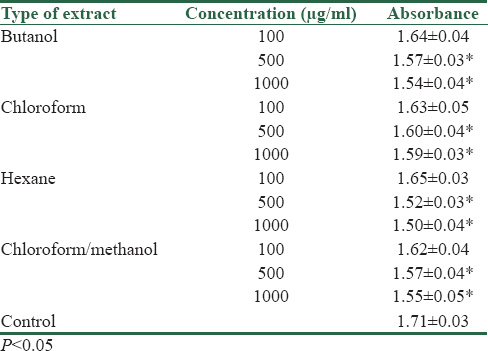 Briefly, 120 μl of erythrocyte suspension (107 cells/ml) and 120 μl of different concentrations (100, 500, and 1000 μg/ml) of S. rosmarinus extracts were added to each well. Erythrocytes were incubated in assay buffer alone, and 100% lysis served as negative and positive controls, respectively. They were sonicated for 30 s on ice at the same settings as for S. rosmarinus extracts. Each set of samples was pipetted in triplicate. Microtiter plates were placed on the ice-cold surface of a metal block. Finally, microtiter plates were taped with sealing foil and incubated at 15°C in the dark for 3 h. Following incubation, microtiter plates were centrifuged for 5 min at 2000 g at room temperature, and 200 μl of each supernatant was transferred to a 96-well microtiter plate, and its absorption was read at 540 nm. To prepare stock solutions, the extracts of S. rosmarinus were dissolved in DMSO, and then the proper amount of distilled water was added. The maximum amount of DMSO was 10% at stock and 1% at the final concentration in the wells. MTT assay was used to measure the rate of cell proliferation. This assay is based on the reduction of MTT to a water-insoluble crystal called formazan. The amount of formed formazan is directly related to the number of viable cells. Subsequently, formazan crystals were dissolved in DMSO and measured spectrophotometrically at 540 nm using micro-enzyme-linked immunosorbent assay (ELISA) reader., 96-well microplates were seeded with 180 μl of cell suspension (5 × 104 cells/ml) except the first row which loaded with 200 μl of RPMI-1640 medium, considered as blank. Then, they incubated for 24 h (37°C, 5% CO2 air humidified). After that, 20 μl of each concentration of S. rosmarinus extracts was added and incubated for 48 h. After that, 20 μl of MTT solution (with concentration of 5 mg/ml) was added to each well and incubated for 3 h. The medium and MTT discarded and 150 μl DMSO was added to each well to solve formazan crystals. Then, the absorbance was measured by micro-ELISA reader. Doxorubicin 20 μg/ml and DMSO 1% were used for positive and negative controls, respectively. The test was done in tetraplicate and repeated in three different days. Standard curves (absorbance against number of cells) for each cell line were plotted. Intraday and interday variations were determined. Based on the standard curves, the percentage of cell survival was calculated. The percentage of cell survival in DMSO (0.5% as a negative control) was assumed 100. SigmaStat™ (Jandel Software, San Raphael, CA) was used to perform statistical tests. Analysis of variance followed by Student–Newman–Keuls test was used to observe the differences among groups. Significance was assumed at the 5% level. Using maceration method for extraction, the extract yields of dried masses after evaporation and solvent removal of hexane, chloroform, chloroform/methanol, and butanol extracts of S. rosmarinus were 0.35%, 1.2%, 1.48%, and 0.8%, respectively. A standard curve was set using 100–500 mg/ml of yucca saponin [Figure 1]. 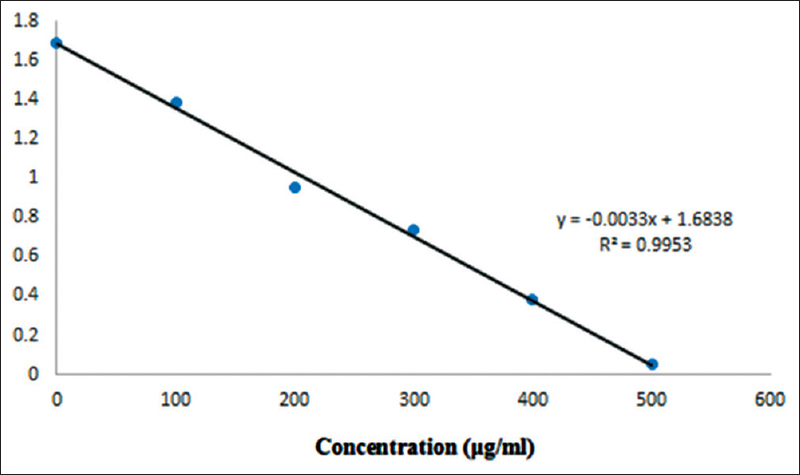 Comparison of the absorbance of erythrocyte in the presence of different concentrations of the extracts of S. rosmarinus is shown in [Table 1]. Standard curves and cell growth curves for HeLa and HepG2 cells are shown in [Figure 2] and [Figure 3]. A good relationship between absorbance and the number of cells was observed for HeLa and HepG2 cell lines (r2 = 0.981 and 0.982, respectively). Intraday and interday variations for all standard curves were acceptable (%CV <15). Doxorubicin (20 μg/ml), a known cytotoxic antibiotic, as a positive control significantly inhibited the proliferation of both cell lines to <25%. Extracts were considered cytotoxic when cell viability decreased to <50%. All of the extracts of S. rosmarinus significantly and concentration-dependently decreased the viability of HeLa [Figure 2]. Chloroform/methanol extract showed better toxicity. 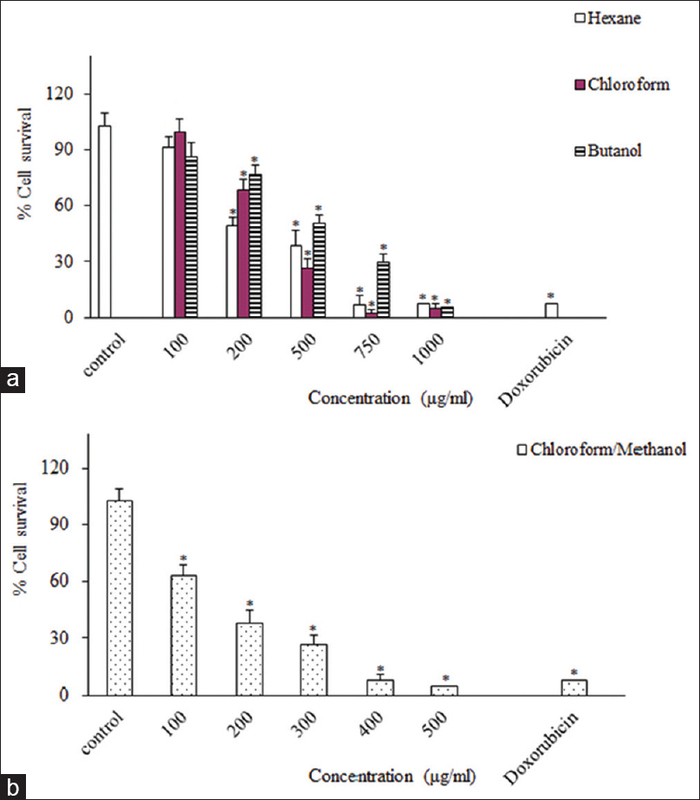 Chloroform and chloroform/methanol extracts of S. rosmarinus significantly and concentration-dependently decreased the viability of HepG2 cells at concentration above 200 μg/ml [Figure 3]. Hexane and butanol extracts significantly decreased viability of HepG2 cells at concentrations above 500 μg/ml. HeLa cells were more susceptible to hexane, chloroform, and butanol extracts of S. rosmarinus compared to HepG2 cells. It has been shown that two compounds isolated from Suaeda glauca (Chenopodiaceae) had protective effects on tacrine-induced cytotoxicity in human liver-derived HepG2 cells with the EC50 values of 72.7 ± 6.2 and 117.2 ± 10.5 μm, respectively. Calzada et al. isolated five flavonoids (pinocembrin, pinostrobin, chrysin, narcissin, and rutin) from Teloxys graveolens (Chenopodiaceae), in which two of them (pinocembrin and chrysin) exhibited cytotoxic activity against E. histolytlica with inhibitory concentration 50% (IC50) of 82 μg/ml. Furthermore, pinostrobin and narcissin exhibited IC50 of 185 and 17.2 μg/ml, respectively. Considering the toxicity of the plants belong to the Chenopodiaceae family and traditional use of this plant,,, we decided to determine cytotoxic activity of the extracts of aerial parts of S. rosmarinus against HeLa and HepG2 cell lines using MTT assay. Doxorubicin, a known cytotoxic agent, as a positive control significantly decreased viability of HeLa and HepG2 cells, indicating the accuracy of the method employed in this experiment (P < 0.05). Our findings indicated that extracts of aerial parts of S. rosmarinus significantly and concentration-dependently decreased viability of HeLa and HepG2 cells. 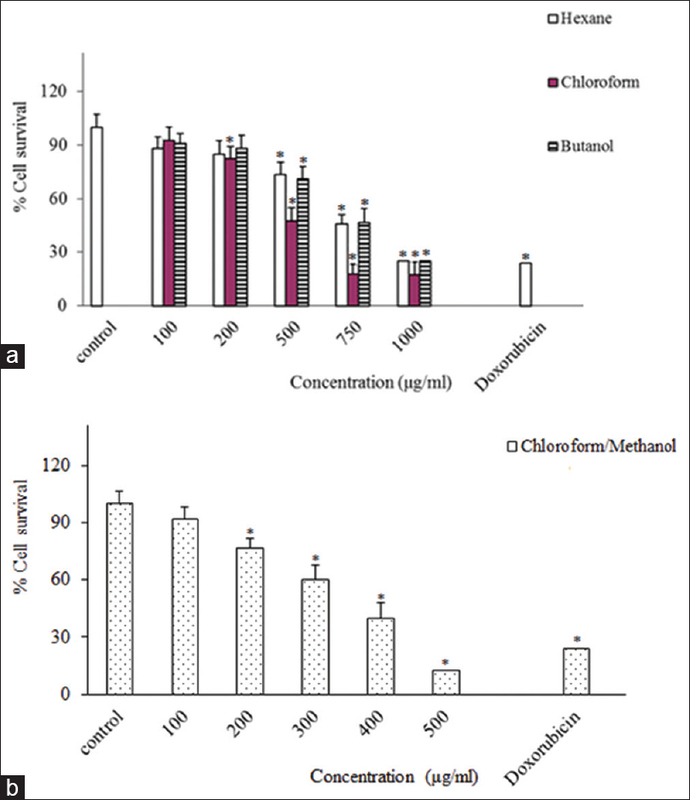 Chloroform/methanol extract showed more potency than the other extracts to inhibit cell proliferation, with IC50 of 150 and 350 μg/ml for HeLa and HepG2 cells, respectively. Several studies have been done on sapogenins, and they found to be cytotoxic.,, However, as there was no considerable difference in saponin contents of different extracts of S. rosmarinus used in this study, other components of this plant should be responsible for its cytotoxicity of it. Therefore, more phytochemical investigation on chloroform/methanol extract is needed to find the structure of cytotoxic components of S. rosmarinus. Graham JG, Quinn ML, Fabricant DS, Farnsworth NR. Plants used against cancer – An extension of the work of Jonathan Hartwell. J Ethnopharmacol 2000;73:347-77. World Health Organization. International Agency for Research on Cancer. Latest World Cancer Statistics. Global Cancer Burden Rises to 14.1 Million New Cases in 2012. World Health Organization; 2013. Li Q, Gao W, Cao J, Bi X, Chen G, Zhang X, et al. New cytotoxic compounds from flowers of Lawsonia inermis L. Fitoterapia 2014;94:148-54. Sufian AS, Ramasamy K, Ahmat N, Zakaria ZA, Yusof MI. Isolation and identification of antibacterial and cytotoxic compounds from the leaves of Muntingia calabura L. J Ethnopharmacol 2013;146:198-204. Patel S, Gheewala N, Suthar A, Shah A.In vitro cytotoxicity activity of Solanum nigrum extract against Hela cell line and vero cell line. Int J Pharm Pharm Sci 2009;1:38-46. Jiménez-Medina E, Garcia-Lora A, Paco L, Algarra I, Collado A, Garrido F, et al. A new extract of the plant Calendula officinalis produces a dual in vitro effect: Cytotoxic anti-tumor activity and lymphocyte activation. BMC Cancer 2006;6:119. Ghahraman A. Flora of Iran; an Iranian Traditional Medicine Reference. Vol. 4. Tehran: RIFR; 1983. p. 481. Maybodi NB, Zare MT. Some ecological requirements and exploitation of Seidlitzia rosmarinus in the desert region of Yazd province. J Environ Sci 2009;6:31-42. Aghili Khorasani SM. Makhzan-AL'Aldvieh. Tehran: Entesharat Rahekamal; 2002. p. 151-2. Hoseini M. Masterpiece of Sage Momen; an Iranian Traditional Medicine Reference. Tehran: University Publications and Printing; 2007. p. 48. Ibn-e- Sina (Avicenna Husain). Qanun (The Canon of Medicine). Vol. 4. Tehran: Soroush; 1991. p. 69. Zolfaghari B, Sadeghi M, Troiano R, Lanzotti V. Vavilosides A1/A2-B1/B2, new furostane glycosides from the bulbs of Allium vavilovii with cytotoxic activity. Bioorg Med Chem 2013;21:1905-10. Hassan SM, Byrd JA, Cartwright AL, Bailey CA. Hemolytic and antimicrobial activities differ among saponin-rich extracts from guar, quillaja, yucca, and soybean. Appl Biochem Biotechnol 2010;162:1008-17. Marshall NJ, Goodwin CJ, Holt SJ. A critical assessment of the use of microculture tetrazolium assays to measure cell growth and function. Growth Regul 1995;5:69-84.
van Meerloo J, Kaspers GJ, Cloos J. Cell sensitivity assays: The MTT assay. Methods Mol Biol 2011;731:237-45. Rezaeipoor-Kardost R. Cytokines and Therapy. Iran: Fatemieh Univ Medical Science; 1996. p. 61-95. Wang QZ, Liu XF, Shan Y, Guan FQ, Chen Y, Wang XY, et al. Two new nortriterpenoid saponins from Salicornia bigelovii torr. And their cytotoxic activity. Fitoterapia 2012;83:742-9. Yeskaliyeva B, Mesaik MA, Abbaskhan A, Kulsoom A, Burasheva GS, Abilov ZA, et al. Bioactive flavonoids and saponins from Climacoptera obtusifolia. Phytochemistry 2006;67:2392-7. Qian M, Yi L, Song-Lin L, Jie Y, Ping-Hu Z, Qiang W, et al. Chemical profiles and anticancer effects of saponin fractions of different polarity from the leaves of Panax notoginseng. Chin J Nat Med 2014;12:30-7. Kerwin SM. Soy saponins and the anticancer effects of soybeans and soy-based foods. Curr Med Chem Anticancer Agents 2004;4:263-72. Auyeung KK, Cho CH, Ko JK. A novel anticancer effect of Astragalus saponins: Transcriptional activation of NSAID-activated gene. Int J Cancer 2009;125:1082-91. Yan LL, Zhang YJ, Gao WY, Man SL, Wang Y.In vitro and in vivo anticancer activity of steroid saponins of Paris polyphylla var. yunnanensis. Exp Oncol 2009;31:27-32. Wen F, Yin H, Chen C, Liu X, Xue D, Chen T, et al. Chemical characteristics of saponins from Paris fargesii var. brevipetala and cytotoxic activity of its main ingredient, Paris saponin H. Fitoterapia 2012;83:627-35. Li N, Zhang L, Zeng KW, Zhou Y, Zhang JY, Che YY, et al. Cytotoxic steroidal saponins from Ophiopogon japonicus. Steroids 2013;78:1-7. An RB, Sohn DH, Jeong GS, Kim YC.In vitro hepatoprotective compounds from Suaeda glauca. Arch Pharm Res 2008;31:594-7. Calzada F, Velázquez C, Cedillo-Rivera R, Esquivel B. Antiprotozoal activity of the constituents of Teloxys graveolens. Phytother Res 2003;17:731-2. Jafarian A, Emami SA, Saeidi M, Sadeghi H. Cytotoxicologic studies of the extract of Iranian Juniperus sabina and Platycladus orientalis on cance cells. J Res Med Sci 2004;9:7-11. Carotenuto A, Fattorusso E, Lanzotti V, Magno S, De Feo V, Carnuccio R, et al. Porrigenins A and B, novel cytotoxic and antiproliferative sapogenins isolated from Allium porrum. J Nat Prod 1997;60:1003-7. Bigoniya P, Rana AC. Radioprotective and in vitro cytotoxic sapogenin from Euphorbia neriifolia (Euphorbiaceae) Leaf. Trop J Pharm Res 2009;8:521-30. Pan WB, Chang FR, Wei LM, Wu YC. New flavans, spirostanol sapogenins, and a pregnane genin from Tupistra chinensis and their cytotoxicity. J Nat Prod 2003;66:161-8.